If perusing your portfolio has you on pins and needles, these choices could provide some relief. Whether you're a younger investor pursuing the next great growth opportunity or a more experienced one whose selection of stocks tends to be less aggressive, every investor's portfolio should have a niche carved out for more-conservative options. Here are three starkly different opportunities -- Aqua America (NYSE:WTR), Franco-Nevada Corp. (NYSE:FNV), and Ecolab (NYSE:ECL) -- that could help investors avoid tossing and turning all night. When it comes to low-risk investments, utilities like Aqua America are among the most popular choices. Tracing its history back to 1886, Aqua America, the second-largest water utility by market cap, currently provides water and wastewater services to 3 million people in eight states. Unlike smaller, regional water utilities, like California Water Service Group (NYSE:CWT), Aqua America has a geographically diversified customer base that mitigates the risk of adverse local weather phenomena. Furthermore, Aqua America deals primarily in the regulated market, so management has clear insight into future revenue, thereby allowing it to strategically plan for capital upgrades to its vast infrastructure. This, in turn, enables the company to increase operational efficiency and generate stronger margins. From 2018 through 2020, for example, the company expects to reinvest $1.4 billion in upgrades to its infrastructure. Granted, investors shouldn't expect to see revenue rise from a flood of new customers in the days ahead; nonetheless, management has demonstrated its prowess at growing the top line through the steady acquisitions of smaller municipal water companies. This, in concert with consistent upgrades to the company's infrastructure, has resulted in revenue increasing at a compound annual growth rate (CAGR) of 2.59% over the past 10 years and operational cash flow rising at a CAGR of 5.55% during the same period. 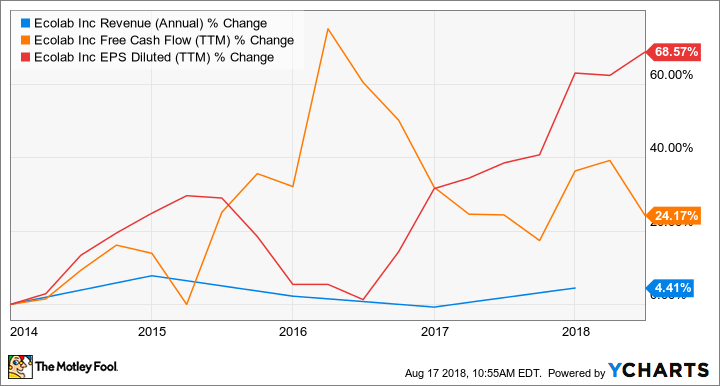 To further illustrate the allure of Aqua America, consider how its performance compares to leading peers American Water Works (NYSE:AWK), California Water Service, and Connecticut Water Service (NASDAQ:CTWS). WTR Return on Equity (Annual) data by YCharts. Over the past five years, Aqua America has consistently demonstrated a superior ability to turn shareholders' investments into profits. 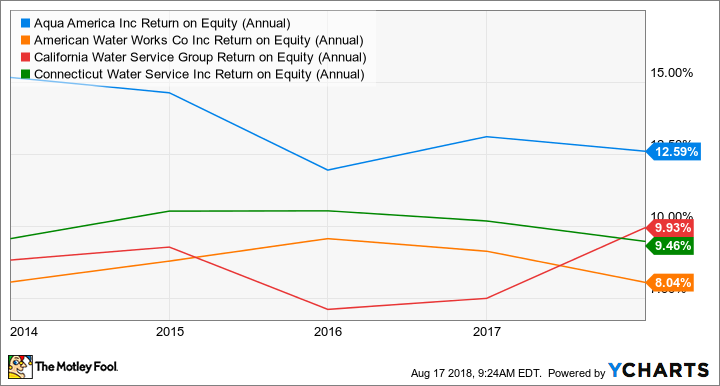 Of course, the company's past performance is no guarantee that it will continue to generate the same type of returns moving forward. It does, however, suggest that management has developed a successful business model for satisfying the water needs of its customers and quenching investors' thirst for profits. Moving forward, investors can confirm the company's growth strategy remains intact as it acquires smaller municipal water systems, a key component of its growth strategy. Over the last 10 years, for example, it has completed nearly 200 acquisitions. Moreover, additional acquisitions remain in the company's crystal ball. Aqua America currently has six municipal asset agreements signed, and it is committed to continuously acquiring additional systems in the future. Unlike gold-mining companies that dig the precious metal from the ground, Franco-Nevada is a royalty and streaming company, which acts like a specialized financier, providing miners with up-front capital to cover the considerable costs of mine construction. In return, Franco-Nevada receives the rights to purchase gold and other minerals at preset prices or to receive a percentage of mineral production from a mine. Over the past two years, gold and other precious metals accounted for an average of 92% of the company's annual revenue. Attempting to mitigate the risk associated with a downturn in any of the precious metals markets, management has identified a long-term goal of generating 80% of its revenue from precious metals. Another way in which the company reduces risk is through the geographic diversification of its assets. In 2017, for example, Latin America accounted for 42% of the company's adjusted EBITDA, while the U.S., Canada, and the rest of the world accounted for 18%, 21%, and 19%, respectively. In 2017, Franco-Nevada reported production of 497,745 gold equivalent ounces -- a company record. And the company expects plenty of growth on the horizon. During a presentation from earlier in the year, management forecast production of 565,000 to 595,000 gold equivalent ounces in 2022, assuming a gold price of $1,300 per ounce; this represents roughly 17% growth over that which it reported in 2017. And positioning itself for further growth beyond 2022, the company has a strong, well-diversified pipeline of assets in the exploration phase of development, including 138 precious metals projects, 70 projects representing other minerals, and 82 oil and gas projects. Fashioning itself as "the global leader in water, hygiene and energy technologies and services," Ecolab helps to meet the needs of its customers in 170 countries, from water treatment solutions for the energy industry to cleaning solutions for the restaurant industry. For conservative investors, Ecolab's attraction is clear: The company provides its services to a wide swath of industries, mitigating the effects of a downturn in any one of them. A mature company, Ecolab was incorporated in 1924. Consequently, investors shouldn't expect the sharp top-line growth that is oftentimes associated with younger companies. With this in mind, the fact that Ecolab grew sales at a modest 4.4% over the past five years should hardly be shocking. The surprise, rather, is the ability with which the business has been able to grow cash flow and profits. ECL Revenue (Annual) data by YCharts. Management's adept ability to grow the bottom line and continuously churn out cash ensures that Ecolab is able to fund operations, complete acquisitions, and satisfy other needs without having to rely excessively on debt. The company, for example, ended 2017 with a net debt-to-EBITDA ratio of 2.4, illustrating how it is not overly reliant on leverage. Moreover, the company retains an investment-grade balance sheet. And according to Ecolab's most recent 10-K, the business holds "current credit ratings of A-/Baa1 by the major ratings agencies." In the days ahead, investors can watch how Ecolab progresses in achieving its goal of greater profitability by streamlining its operations. By developing digital platforms and other cost-saving initiatives, management has targeted a goal of a 20% operating margin, a notable increase over the 14.3% operating margin it has averaged over the past five years. Appealing to risk-averse investors, Aqua America, which provides vital services to millions of customers, will surely not see demand ebb anytime soon. Franco-Nevada, moreover, represents another possibility since demand for gold -- prized for thousands of years -- is unlikely to wane in the coming days. And Ecolab, whose solutions are sought by a wide swath of industries, represents another viable consideration for investors who are keen on avoiding risk.